My daughter just started kindergarden… I really can’t believe it. The time I part-dreaded/part looked-forward-to has finally arrived! Sending off my girl into the big world… It’s a big step for her and a dose of reality for me. My baby is growing up and a new chapter in her life – and mine – is beginning. I’m getting the hang of waking up at 6 am and making her lunch, getting her dressed, fed, ready… Some mornings I feel like I am in school too!! I struggled with the idea of homeschooling, which I find wonderful for many reasons, though I think my daughter is one who will thrive in the social environment of which modern day public school is… Plus she’ll have access to some things that aren’t as accessible to me daily (computer lab, science equiptment, my undivided attention for 8 hours). Now that I’m working outside the home anyway, I’m not home as regularly to teach her as public school can! I wanted to make this recipe because my daughter LOVES snacking on these straight from the fridge. They are an excellent quick go-to healthy snack for anytime, such as right after school or while dinner is cooking! They are also an excellent topping for salads… a great way to incorporate a little extra protein (and hey, maybe get your kid to try a salad)! I strongly recommend using the firmest tofu you can find. I like to use bulk tofu, which is usually super firm! Turn the tofu on its side and slice the tofu in three slices lengthwise. (I cut down the middle first then cut each side in half carefully). Then lay the tofu flat and cut vertically and horizontally, turning it into 16 squares. 1) Using a large nonstick pan, lay out all 16 squares of tofu. 2) Add all of the other ingredients (except the sesame oil) right on top, drizzling the brown rice syrup and sprinking the ginger over the squares, then cook on med-high heat, jiggling your pan occasionally. Once you see the liquids cooking down some, flip your squares over carefully, then continue cooking until most liquid is gone. 3) Lower heat to low-medium and drizzle the 1 Tbsp sesame oil over the top. Cook until only slightly wet. Let cool on pan for several minutes after cooking, then refrigerate until ready to use. Store with any extra “sauce” and refrigerate. Eat right from the fridge or on top of a salad! Before serving on salad, cut each square diagonally (making two triangles). This tofu accompanies this Nori Sesame Dressing like a dream come true! Keep refrigerated & eat frequently! Wow… Spring already? Boy is time flying… and there has been a lot going on at your vegan neighbor’s house lately, which has been making things seem to move along even faster. Most recently, I started working at an awesome little shop downtown. (In fact, it was my first job in town when I moved here 13 years ago!) It’s great to be back again (despite being away from my kiddos) because I really loved working there and being downtown. I reluctantly let this job go when I got hired to work as the bread baker full-time at the Green Scene Baking Company (a vegan bakery/restaurant), which is no longer in business… not because the food wasn’t great, but because the owner decided to move to California and become a nutritionist! I’m sure all of Athens misses the Green Scene – I know I do! Anyway, I apologize for not posting for so long – I promise it’s not a sign of things to come!! I just needed some time adjusting to my new schedule and some other changes. And now that I’m a working mom (*all mom’s are “working moms” but what I mean here is outside the home), I will be able to relate more easily to those of you in that position, and I’ll try to post more recipes that will help make dinner simpler for everyone! That said, I am more than ready to start sharing some of my favorite spring & summer recipes with you! Apply to greens (with salad toppings of choice) and DEVOUR! We started out our day this morning in the garden. Our garden is currently producing cucumbers at warp speed , so I’ve been trying to think of recipes that use cucumbers. Ironically, this recipe doesn’t contain any cucumbers, but bear with me! There will be some coming! I am not a HUGE cucumber person… I’m not sure why I planted 6 (yes, six!) cucumber plants in our garden this year. But, on the bright side, it’s been forcing me to eat cucumbers with a vengeance. So far, with our first ones, we’ve been making salads… eating cucumber & cream cheese sandwiches… we have had hummus with slices of cucumber on the side… falafel patties topped with cucumber and tomato. I think I may try to make my own pickles this year with some of them. What is your favorite thing to do with cucumbers? This morning we made a big “Green Juice” in the juicer, containing (surprise!) cucumber, apple, kale, spinach and celery. It was really refreshing! My kids didn’t care for it though -not sweet enough I guess! Maybe I will add more apples for them next time. It’s finally starting to really feel like summer here in good old Georgia, with pleasant morning temperatures climbing high late in the afternoon… but it’s not late enough in the year to be deathly hot yet! 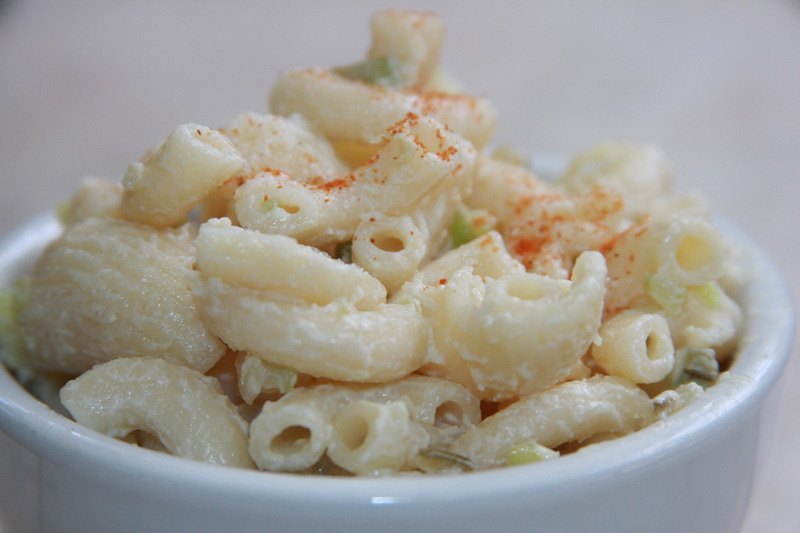 Ahhh… it’s totally one of those days that makes me want to make sweet tea (if you’re from the south you will know what I mean) and grill out vegan hot dogs with macaroni salad and potato chips on the side… which brings me to today’s recipe – Macaroni Salad! This macaroni salad is delicious, easy AND healthy… it is tofu based instead of mayo based… You could use vegan mayo if you wanted to, but trust me and try this first – everything I have ever made from scratch always turns out better! Make this ahead of time and keep cold until ready to serve. Even though it’s not made with mayonnaise, I personally don’t like to leave anything that should be cold sitting out in the hot sun for long! This is a great salad to have around on the Fourth of July or at any picnic or cookout! I changed very little from the original recipe, which is from Vegan Planet, one of my first and very favorite cookbooks! Robin Robertson never lets me down. She makes vegan cooking seem so easy! 2- In a blender or food processor, combine the tofu, soy milk and process until smooth. Scrape down the sides and process again. Stir in by hand the onion, celery, relish, lemon juice, mustard, salt and cayenne to taste (or save the cayenne for last and sprinkle on top as serving). Add the cold (drained) pasta noodles and mix well. Cover and chill at least 1 hour before serving cold. Devour… alongside your other favorite summer dishes! 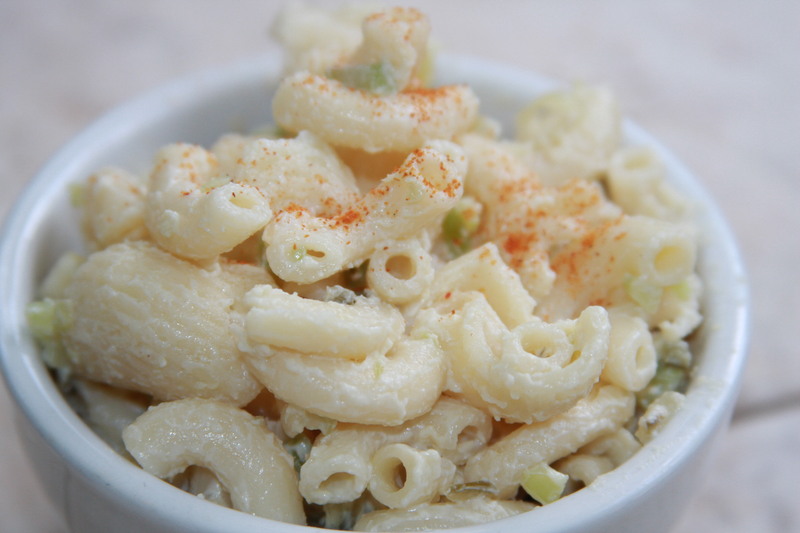 This easy macaroni salad is a great addition to any BBQ, cookout or picnic!